Who knew there was a national day dedicated to doughnuts? Well, apparently the whole world knew – except me. A few weeks ago, social media had a very sweet day with pictures of all sorts of delicious doughnut creations. From the best gourmet doughnuts, to homemade versions, they all turned into inspiration for me in the kitchen for creating my own doughnut recipe. Deep frying was out of the question, both for nutritional purposes; also a big pot filled with oil at high temperature oil is not my idea of happy cooking. But how do you keep the moist and soft texture you get when you bite into a doughnut when baking instead of frying? I played around with the ingredients and found that using coconut oil and peanut butter was the perfect solution for a doughnut like mouthfeel and flavor. So although you may substitute some ingredients in this recipe, using coconut oil and peanut butter is a must. Collecting kitchen gadgets is somewhat of a hobby for me lately, but I haven’t added the “doughnut pan” to my pantry just yet. 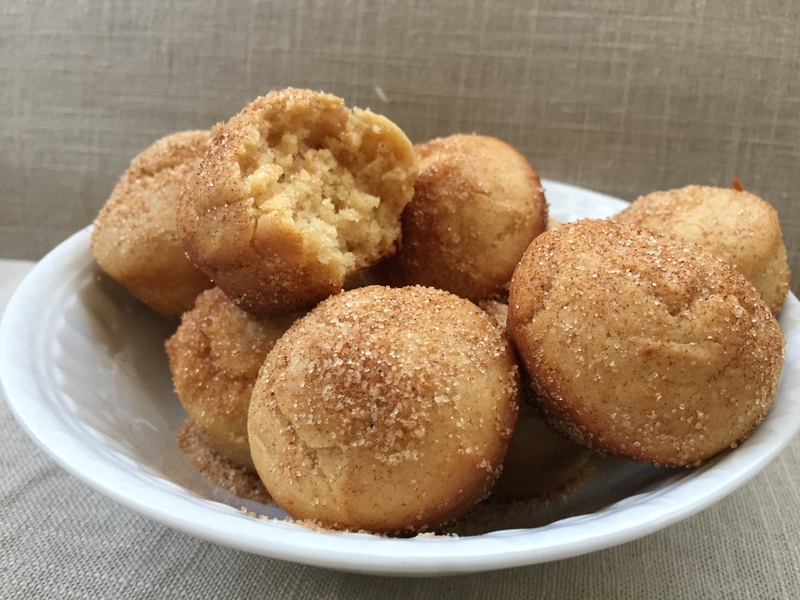 Therefore making doughnut holes using a mini-muffin pan was the way to go! The small pan made these tiny treats perfectly- sized since who can really just eat one, right? And you don’t have to feel guilty about popping two or three of these into your mouth; they are a much healthier version than their traditional deep fried, high sugar, low protein alternatives. 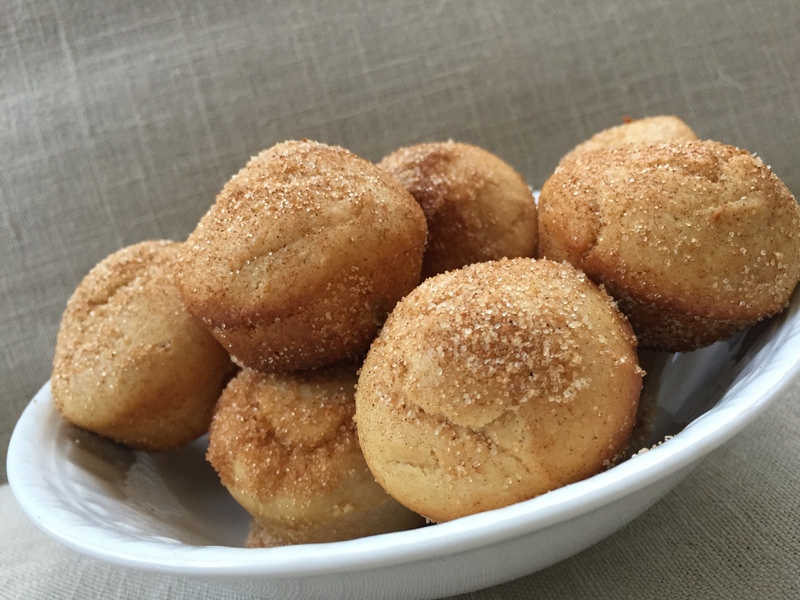 You may notice this recipe has the same ingredients as a previously shared recipe for our “Peanut Butter and Jelly Muffins”. It’s fantastic when one recipe can be made into so many different ways! I have made the recipe below with a gluten- free flour mixture, as well, for a friend and it worked beautifully. Preheat oven to 350 degrees F. In a medium size bowl, add sugar, peanut butter, and mix well; then mix in flour, salt and baking powder. In a separate bowl whisk together egg, milk, vanilla and coconut oil ,making sure that all ingredients are at room temperature. Combine ingredients in both bowls and mix well. Add to mini-muffin pans, filling almost to the top of each cup. This will make them more rounded when they rise in the oven. Bake until you can insert a toothpick, and it comes out clean. Depending on oven settings, this usually takes 15-20 minutes. Brush each doughnut hole with coconut oil and roll it in the sugar and cinnamon mixture. The recipe makes about 18 doughnut holes. Store them in air tight container for up to 4 days. They are best when warm and fresh! By the way! Have you heard of http://www.yummly.com? What a magnificent way to save all our recipes and even create a recipe grocery list that you can see on your smart phone! Yummly puts every recipe in the world in your pocket. The most powerful recipe search, the recipe sites you love, your digital recipe box, recipe recommendations just for you, and a smart shopping list – all with you wherever you go. Visit the website and start adding our recipes to your recipe box! This looks like a fun and easy recipe my family will enjoy. I love doughnuts and baked peanut butter are even better and healthier than fried! I must try these now! i have tried quite a few of the recipes you have posted and never been disappointed!!! thank you! Thanks Rebecca!!! Have a great weekend!! These sound like they’d be delicious with a little chocolate glaze. What a perfect recipe! The best way to have a healthy breakfast, freshly made! I’d like to try these! Oh wow! These look delicious! I love donuts and peanut butter! Look so good!! Thank you! Goodness, is there anything peanut butter cant make bbetter? I swear these aree making my tummy rumble. They would be great and I bet they even freeze well! BTW ellen beck on form it wont let me change names! These sound amazing! I am going to surprise my family and make them this weekend! Thanks for the awesome recipe.